Buy yourself flowers. Who says you need to wait around for a man to buy you flowers? I think I buy myself flowers almost every time I go to Trader Joe's. Not only do flowers instantly boost my mood but they also brighten up any space and give off such a happy vibe. Treat yourself to something that makes you feel good. This could be a facial, massage, spray tan, manicure, etc. For me, it's definitely a spray tan. Being ghostly pale in the winter months doesn't make me feel good about myself. I get a spray tan almost every week for that extra boost of self confidence. Look good, feel good - ya know? Give yourself a daily compliment. We truly are our own biggest critics. It almost comes natural to think about things that we could be doing better, how we could look better, etc. We are always the first to point out our own biggest flaws, insecurities. When was the last time you complimented yourself? Try complimenting yourself once a day for a straight week. Examples could include: I have great work ethic; I really love my eyebrows; I am really good at networking. Find an occasion to get dressed up. I'm a firm believer of the 'look good, feel good' mantra. As much as I love a cozy night in, sometimes a huge confidence booster is getting dressed up, playing with some new makeup, and doing my hair. Set up a romantic date night with your boo at a boujee new restaurant or go split (a few) bottle(s) of wine with your girlfriends at a cocktail lounge - any excuse to get dressed up! Have a date night with yourself. Get some takeout from your favorite place, buy a fancy bottle of wine, watch a guilty pleasure rom com, and end the night with an aesthetic AF bubble bath complete with candles and (more) wine. You don't need a man to wine and dine you - you can do it yourself and guess what: it's actually really fun and there's no need to worry about potential awkward silences or goodbyes. Splurge on something you've had your eye on. You've probably spent the last couple of months stressed out with all the gift buying for Christmas. Now it's your turn! You deserve to treat yourself to something nice. Maybe it's a new purse, some kind of household appliance, or maybe it's a random knick knack that's been sitting in your Amazon cart for a month. Allow yourself to splurge without feeling guilty. You deserve it! Keep a journal. Keep constant lists of what you're grateful for as well as doodles/manifestations of your dreams and goals. There are numerous studies that show journaling can help improve your mental and physical health. Journaling can help cope with stress, relieve anxiety, and boost immune cell activity - as well as many more benefits. You can even go on Pinterest and search 'journal prompts' if you need help getting started or encounter a 'writers block'. Go on a social media detox. Like I mentioned this in my LAST POST, social media can be such a dangerously toxic space. We spend hours of our day scrolling and comparing our lives and happiness to strangers on the internet. Let's challenge each other to go 24 hours without social media. Let's take this time to focus on ourselves or on the company we have. There's nothing worse than trying to have a conversation with someone as they're scrolling on their phone. I know I'm guilty of this too, but I'm making a conscious effort to 'be here now'. Plan a trip. There's no better feeling than having something fun to look forward to. Now that it's the beginning of the year and all the PTO has re-set, it's the perfect time to plan a vacation! I absolutely love traveling - especially to places I've never been before so planning trips definitely brings me genuine happiness. Even the actual planning/details of the trip is very fun and therapeutic for me. I love creating potential itineraries, browsing airbnb's, and finding good flight deals. Volunteer. Give to yourself by giving back to others first. There's no greater feeling than being a part of something that helps someone less fortunate than you. My favorite place to volunteer is at Feed My Starving Children. FMSC is a non-profit organization that packages and distributes food filled with vitamins and nutrition to children in developing nations. There are so many amazing organizations and great causes out there and it's so easy to get involved and it feels so good doing so as well. Go outside. Yes, I'm aware that it's a brisk 30 degrees in Chicago currently, but go outside and get some fresh air. Seasonal depression is at an all time high and I really feel the weather getting down my mood. We just got a dog last week (!!!!!!!!!) and I have been absolutely LOVING taking him on walks. Yes, even in the cold! This is my time to clear my mind and get my body moving. Get re-inspired. If I'm ever in a weird mood or feeling down about myself it's usually because I find myself un-inspired which leaves me feeling un-motivated and just overall very 'blah' with no purpose. Anyone else? To get me out of this funk I turn to people who get me re-charged into an inspired, motivated, girl boss mode. I love listening to The Skinny Confidential podcast, or watching Youtuber's such as Danielle Carolan, Maggie Macdonald, and Brooke Miccio. Celebrate even your most little accomplishments. Who said you can only celebrate a major milestone like a promotion, birthday, anniversary, etc? Not that those shouldn't be celebrate but it's also great to celebrate your little accomplishments to encourage positivity and self love. You made it through the work week! You beat the afternoon commute! You made your bed! You washed your hair this week! WOOHOO, go you. Write a letter to someone. I don't know if this has anything to do with what I mentioned above (feeling good about doing something for someone else) or if it's because I feel like a real adult when I have all the necessary tools to send a real letter (envelope and stamps) but writing handwritten letters or notes to friends when they aren't expecting it brings me so much joy. The anticipation leading up to the delivery followed by a surprised and happy friend makes me feel so good. One habit/routine that has really helped me fall in love with myself recently is focusing on my skincare routine. I've been so obsessed with trying tons of new and different products and lines and finding products that work well with my skin and lifestyle. For the past month I've been trying out the products that C'Nu Skincare (pronounced See New) that they were so kind to send over to me. C'Nu Skincare is a monthly luxury skincare subscription box that sends over four to six full-size products straight to your door each month. For just $52 per month you get a value of products over $150! Best part? All products are cruelty-free, chemical free, and made with natural sustainable ingredients. My skin feels so fresh, moisturized, and glow-y! I didn't only fall in love with their products but I fell in love with their mission too. C'Nu Skincare is dedicated to helping you manifest a more positive reality through the accentuation of your natural beauty. The C'Nu impact goes further than their amazing products and uplifting mission. They also donate a portion of EVERY subscription to The Humane Society of The United States to join the fight against cosmetic testing on animals. Use code 'SEENEW' for 15% off any monthly or bi-monthly subscription! Join the #cnuskin movement while falling in love with yourself. I need to do these more!! A trip is always a good idea and I fall in love with myself everyday. Love this! I'm all about taking care of yourself and doing things that you enjoy. Agree to all of these, self indulgence is a must every now and then to recharge our batteries and in return give a better service to others. Nice read! I'm not going to lie...a little jealous of your heatwave as I've been braving the 9 degrees in Chicago today! Great Post. I think a personal date night is an awesome idea as well as the social media detox!! I feel an instant shift in my mood when I take the time to get dressed up and do my makeup every once in a while!! Thanks for reading danielle! Love this post! 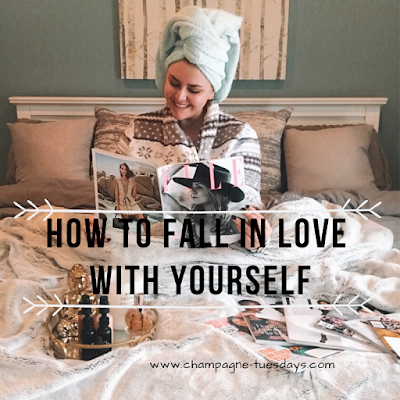 We always forget to take care of ourselves and I love the idea of using Valentine's Day to give yourself some love! Girl these tips are awesome! These are all wonderful tips. You're right that it's incredibly important to love yourself as well as others. Thanks for sharing these. Great tips! Social media detox is this what I need now. I agree with you! Sometimes we need to give ourself what we need, instead of waiting for others to do so. I'm digging this post, babe- so important to take care of ourselves + show ourselves some love! yesss, thanks for reading babe! wont believe, but those tips i badly need to recover myself from broken heart. Thanks for the beautiful post. I used to buy fresh flowers every Saturday for my living room, I need to start doing it again!!! The are a mood booster and they look so good!! I love that tradition so much!! I love every tip that you shared here! I am in total need of this. I should start journaling again. Come to think of it let me go for a walk, and buy myself a pretty journal notebook now LOL.